In my never ending effort to throw money at my car I decided it was time for a bigger IC. Who knows, perhaps one day it will be mated to a single turbo . 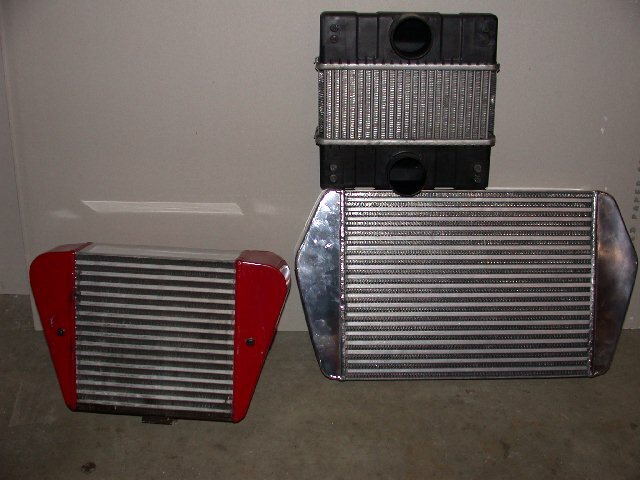 In reality the opportunity arose to purchase one of, if not the very last, Crooked Willow Racing Intercoolers. A beautifully made stock mount IC, that road racers prefer, that had been very well polished and came complete with very trick carbon fiber ducting - the only one in the industry. 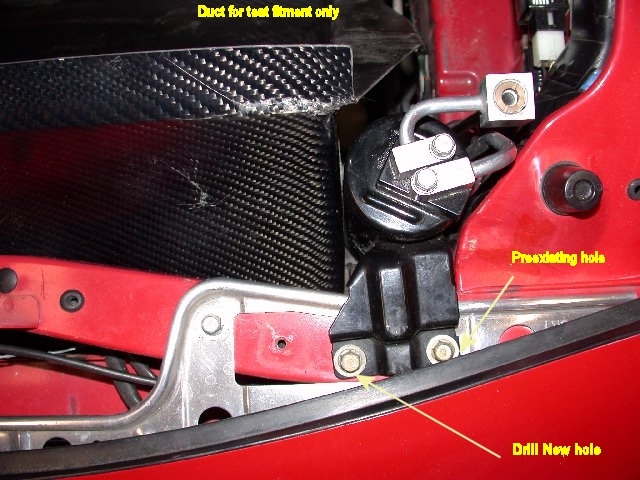 The entire kit included the polished IC, the carbon fiber duct, 8 Breeze "T-bar" coupler clamps, and polished mandrel bent aluminum IC inlet and outlet piping. I was given a price break due to the omission of the silicon couplers - I wanted red couplers anyway. The CWR IC is what can be described as a "large" IC, comparable to the M2 large and the Pettit "Cool Charge II" IC's. Bench testing of flow, from what I have gathered, indicated pressure drop less that what was seen on the smaller PFS IC. As for it's cooling efficiency I don't think one can argue that in this case size does matter. Why the need for this enormous IC? Well several things come to mind. The first is the rather high air intake temperatures I was seeing (as indicated on the PFC Commander) at the track when running 12psi of boost. Too high is debatable, but hotter air means less power and which making the engine more prone to detonation/preignition etc. etc. 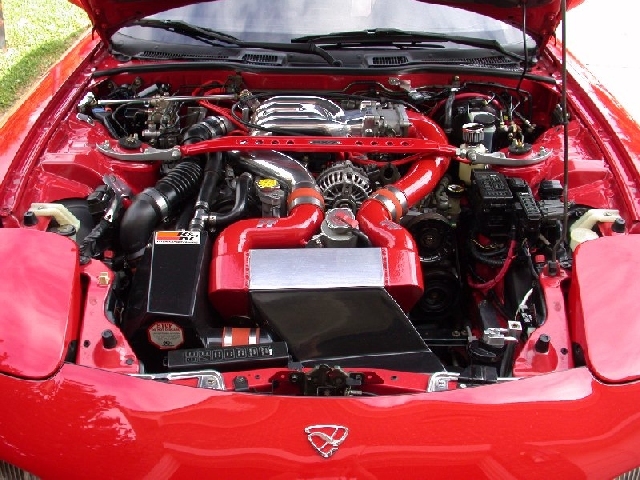 The other reasons are more subjective, like the wide open space left in my engine bay when I moved the battery, or the possibility that sometime in the future I will upgrade the turbo setup in my car when the stock setup packs up on me. So why did I choose the CWR IC over the only other option I considered, the M2 large? Well, price and availability. The CWR was cheaper and the M2 large was backordered *at least* 3 months. 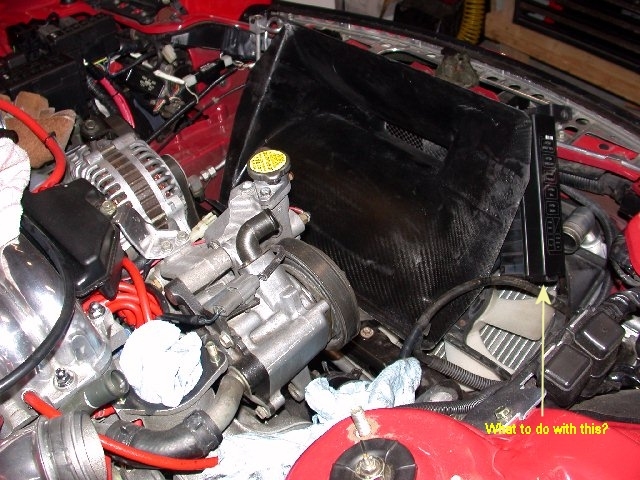 Additionally, the M2 large has similar clearance issues with the OE air pump, did not have the trick carbon fiber IC duct, and which would present problems when trying to figure out where to mount the AST. M2 advocates eliminating the AST altogether. Plus I wanted to be different! And thus below begins the chronicles of my installation effort and the trials and tribulations of making this monster IC fit and look good enough to satisfy my standards. OBTW a "day" is what I would consider to be anything from 8 to 16 hours of labor or a "weekend's" worth of work. 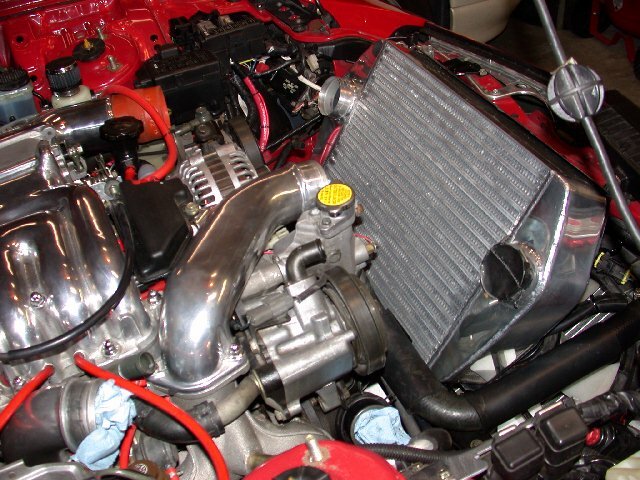 For the record my car as it was in the beginning with PFS IC and old air intake - but no battery. 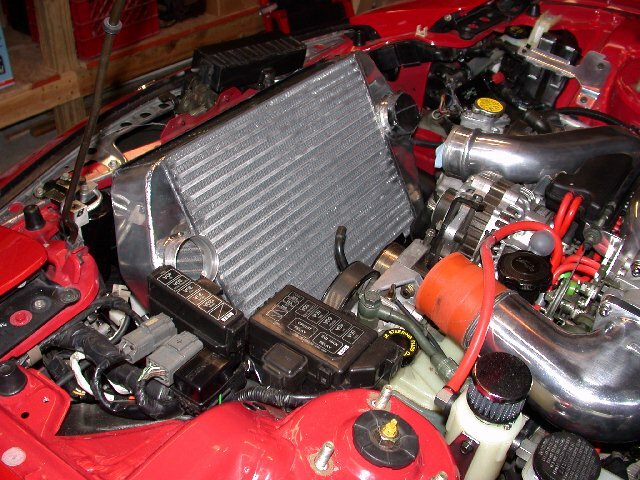 Peter Farrell Supercars IC, Crooked Willow IC and Stock Intercooler. Quite the disparity in size. The PFS and the CWR are, however, pretty much the same thickness. 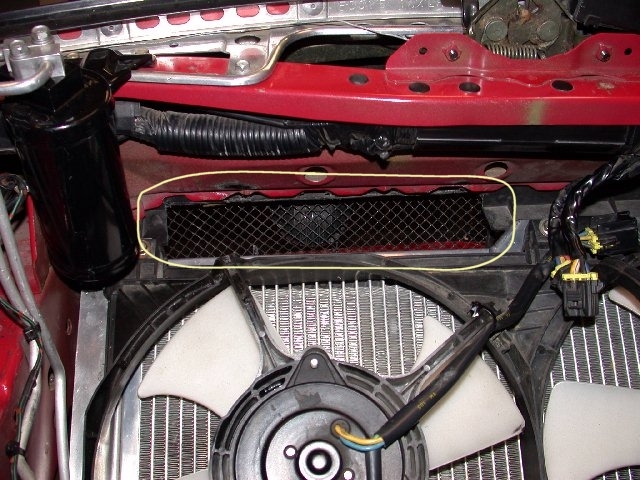 In addition to the fan shroud trimming modification to the radiator mounts was necessary to allow clearance for the IC duct. 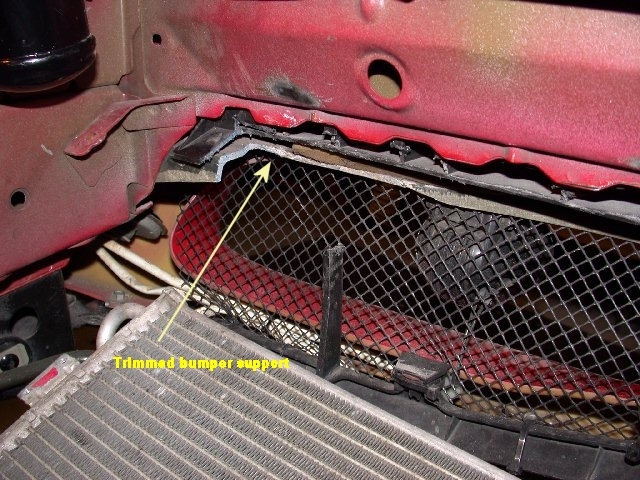 The bracket holes were lengthened and the rubber isolation dampers removed and replaced with thinner rubber pads. With the duct now fitted it was time to move on to the lower IC brackets. Well of course these didn't fit "perfectly." Sure I could have just bolted them on and tightened the bolts but that's juts not me. 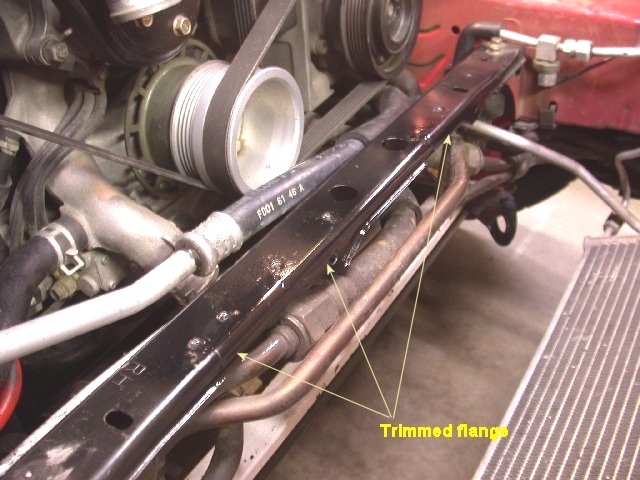 So the cross member flange was trimmed to allow the IC lower brackets to sit squarely. The edges were painted to inhibit rust. 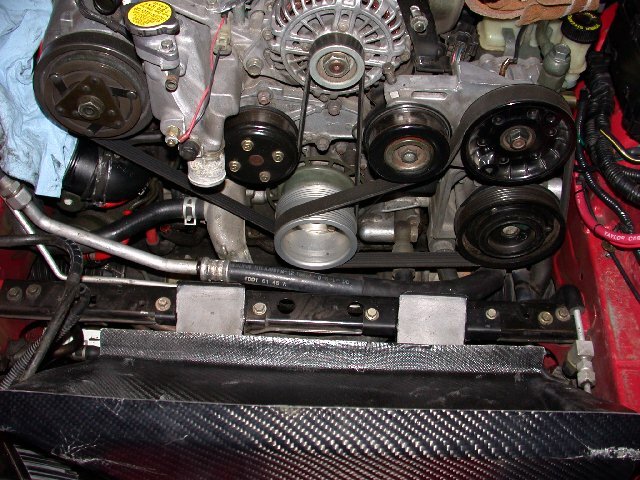 Pictured are the IC lower brackets installed. An additional hole was drilled to accommodate the hole pattern in the right hand support . 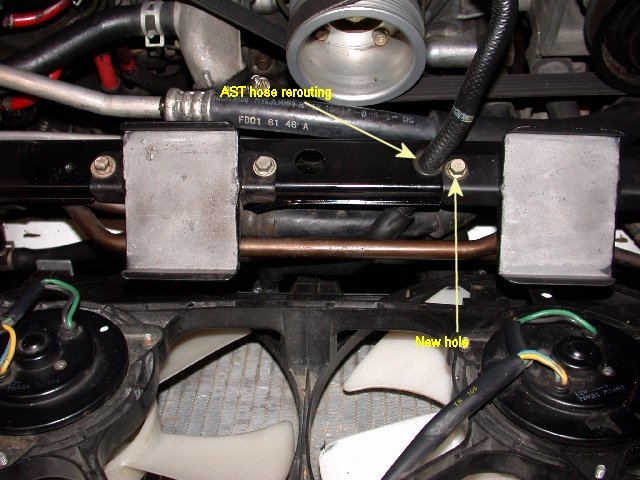 Also seen is the new routing through the cross member for the lower AST return hose. 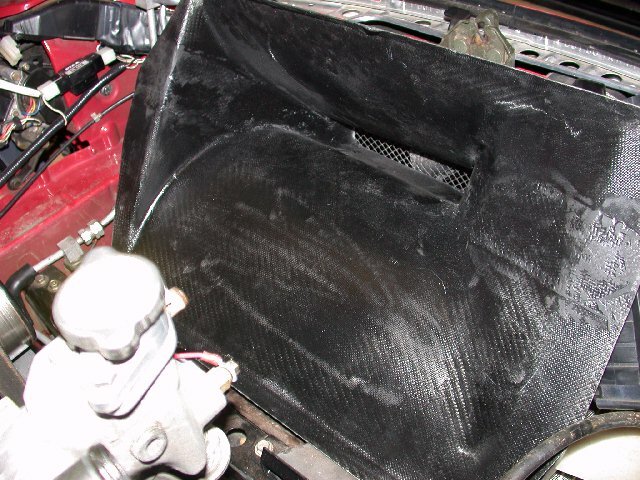 The installed duct. With every step forwards there seems to be two steps back. 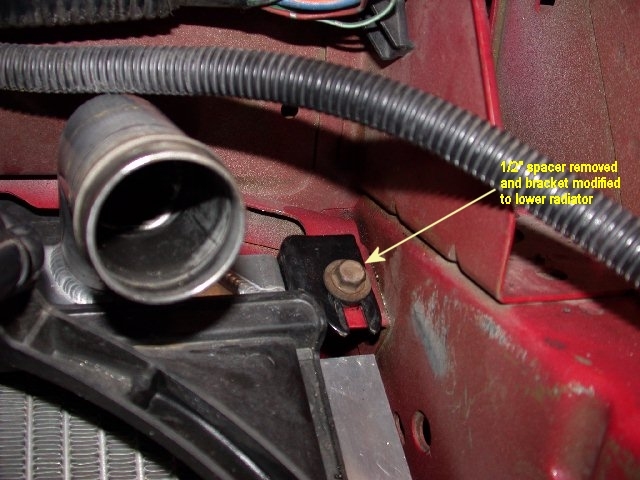 A problem issue yet to be resolved: how to re-fit the front fuse box? It would "fit" with lots of force and probably about a dozen zip ties but again it would look really crap and definitely not my style. I later concluded that the relay box would have to be moved. 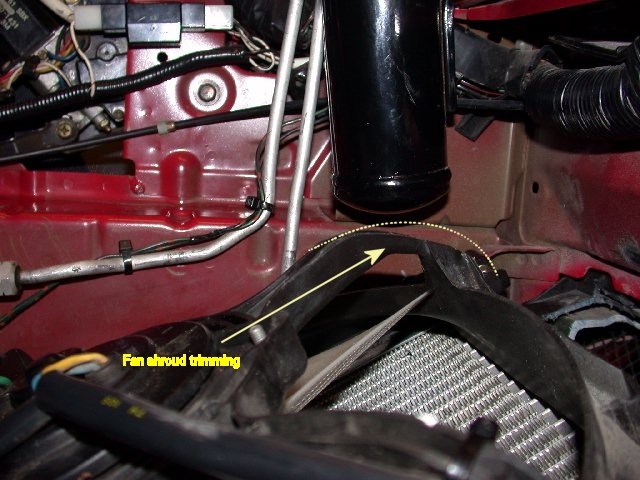 Just a picture to show how smooth the IC inlet airflow is form this vs the PFS duct and perhaps the M2 ducts that are more square and have a few protrusions into the air stream. Does that make a difference, probably but I can't confirm it. Just to keep my spirits up at this point in the install I dropped in the IC for a rough fit-in. 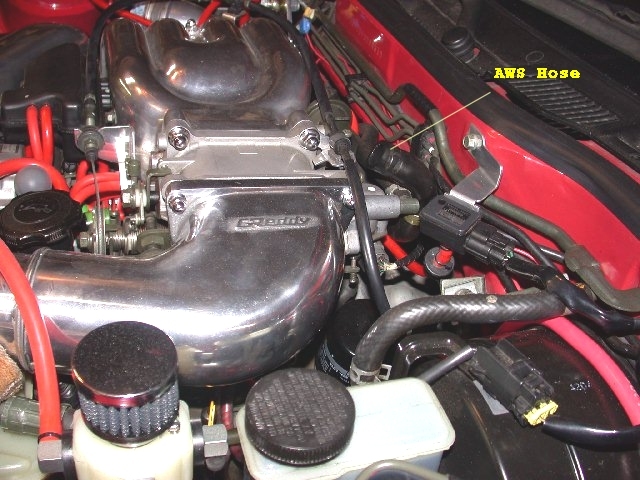 As with any large IC install the GReddy elbow becomes a necessity. Pictured are the GReddy elbow and AWS (automatic warmup system) hose that will be removed and capped. I'd fretted over this problem (I don't like disabling things without legitimate proof derivability will not be affected) for some time until someone informed me that the Apex'i Power FC does not use the AWS. So it was simply a case of capping the air pipe with a rubber cap and worm gear clamp. I've had no startup and derivability issues.